Thanks a lot for the replies! I will be doing some more research before I choose. I would love to take it to the Brevard tropical fruit tree sale but I’ll be in North Carolina next weekend. You're lucky. Mine bloomed like crazy and now has only 2 fruits developing. Oh sorry to hear. I think the bees were hard at work on my tree. How do you deal with the frost in Germany @usirius? 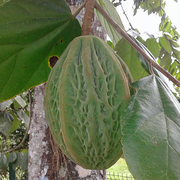 Is not too cold there for Cherimoya survival or fruiting? 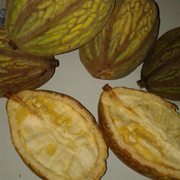 We have a new fresh amount of SEEDS of the THEOBROMA BICOLOR (White cacao). Delicious fruit and one of our favourites! We have FRESH Harvested so for the best Quality order quick. Our vision is "sharing is caring" and we want to share these great fruits for a friendly price. Tropical Fruit Discussion / Re: Eugenia Mystery Plant ID Help Please!